Frank Lampard is raring to go after a two-week break. 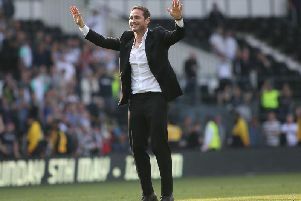 Frank Lampard says he and his Derby County squad are more than ready to return to action as they prepare to face league leaders Sheffield United on Saturday evening. The Rams host the Blades in the day's late kick-off, having had a fortnight away from league action since the draw at QPR on October 6. And, as they prepare to face a team in good form and flying high at the top, Lampard is well aware of what's in store. He said: "They have got good players, they are a good team and they are used to a way of playing in the last couple of seasons. I have watched them a lot and they have a very good team and are a good unit. “They are very well managed and they are top for a reason, for the way they have been playing. It will be a fight for us physically, because they have a very competitive team, but also in terms of the way they play their football. “I think they are open, they are expansive with the way they play, and they involve their centre backs in attacking play to a big degree. Curtis Davies could be back in contention for a start having been out for several weeks with an injury and having been involved in the squad at QPR, while midfielder George Evans is continuing to get back to fitness after a bad knee injury picked up against Ipswich in August. Lampard, meanwhile, says the two weeks without a game have been far from quiet. He said: "“I’ve had a lot of people contact me over the last 10 days to see how I’ve been getting on in my ‘break’, but it’s the opposite! “It’s as busy because your mind is buzzing, you are looking at the next section of games coming up, you’re working hard on the training ground with the players, then you’re looking at the future in different ways so you don’t really switch off as a manager.